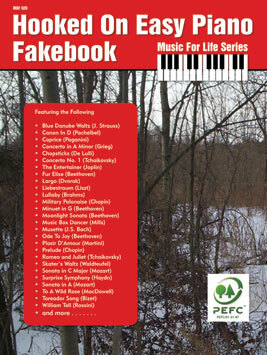 Hooked on Easy Piano Fakebook Volume 1 includes the same works as Hooked on Easy Piano Classics Volume 1 creating a great companion book. Titles include: Für Elise (Beethoven); Canon in D (Pachelbel); The Entertainer (Joplin); Chopsticks (de Lulli); Surprise Symphony (Haydn) and many more. Every pianist – young and old – will love this collection and sound great!